easy to divide or propagate, for sharing through Open Source PlantsTM. not patented or invasive in the target environment. So, we are making a list! For now, the list is being made with Iowa, USA in mind, but we will expand geographies as we go. At the top of the list right now is the osage orange, Maclura pomifera. The osage orange (also called bodark, hedgeapple, bodock, horseapple etc.) has much potential for climate resilience. Its native range at the time of European settlement was eastern Oklahoma and Texas, with an apparent disjunct population in the Chisos Mountains of southwestern Texas. Accordingly, osage orange is tolerant of heat and drought. Interestingly, it is also tolerant of periodic flooding and was found in its highest densities in rich river bottomlands (the so-called “bodark swamps”). It has very few pest or disease problems and grows without special care at least as far north as central Iowa (there are dozens of mature specimens in the unmanaged woodland river bottom behind my house in Ankeny, Iowa). It is tolerant of salt, urban air pollution and very poor sites; it has even been used for mine reclamation. In other words, this species is one tough customer. Whatever the future climate might bring — hotter, wetter, drier, etc. — the osage orange is genetically braced to survive. Another intriguing property of this species is rot resistance. Farmers have long known about the durability of the wood, and it is used for fenceposts to this day. 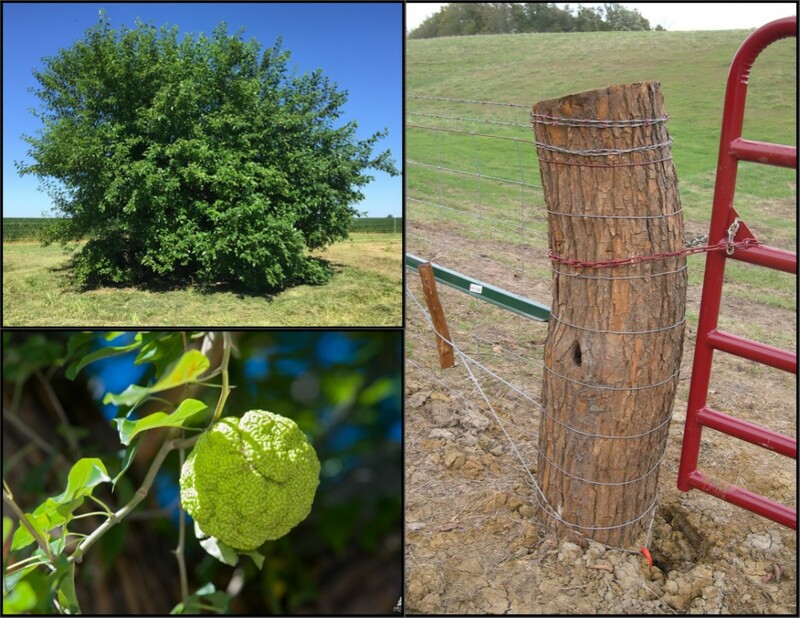 In one study at Oregon State University, untreated osage orange fenceposts have been “spectacularly durable,” and are still sound after 86+ years in the ground (Jeff Morrell, personal communication, February 2016). In fact, the untreated osage orange posts have outlasted all other tree species, including those treated with preservatives. 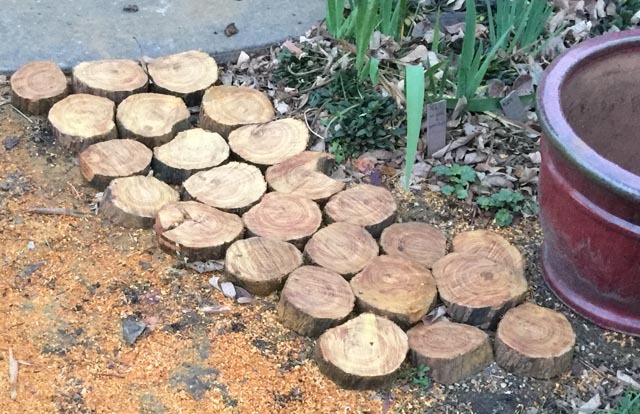 Using the untreated wood of this species for terraces, fenceposts, pavers, or other hardscape purposes will provide decades of resistance to decomposition — and thereby extend carbon sequestration long after the tree is dead. Consequently, using locally grown osage orange wood, instead of manufactured, transported, cementitious hardscape products, reduces the carbon footprint of gardening. Pictured are some sections cut from a dead branch from my own tree — awaiting placement as pavers. Finally, osage orange wood has one of the highest BTU ratings of any firewood and has potential to offset fossil fuels for heating. So . . . what’s the catch? Well . . . the average osage orange is not the most ornamental tree (for most, I suppose — I love its “wildness”). It can have a gangly, multi-stemmed habit and vicious thorns. The massive fruit are dangerous bombs when they drop in the fall and they create a mess — or an opportunity for Halloween decorations, depending on your point of view. Many farmers find it a nuisance, and curse its propensity to spread by suckering and to resist eradication. Thorns have been reported to puncture tractor tires and the tree roots to scavenge water from nearby crops. The firewood burns hot, but is also prone to popping and sparking, especially when green. So, growing and using osage orange in a home garden or other urban environment is not for the faint of heart. Fortunately, there are varieties that are both thornless and fruitless. ‘White Shield’ and ‘Wichita’ are thornless males. As far as cold-hardiness, osage orange has suffered from winter-kill or die-back in northern Iowa and Nebraska. The mature specimens in my backyard in central Iowa show they can survive at least this far north. In a warming climate . . . who knows? The assisted migration of such a durable tree species farther north for testing seems reasonable. ‘White Shield’ is currently in performance trials in California specifically to test resilience to climate change. Switchgrass is one of the dominant plants of the tallgrass prairie. Several cultivars are available in commerce with variations in form, size, and leaf color. 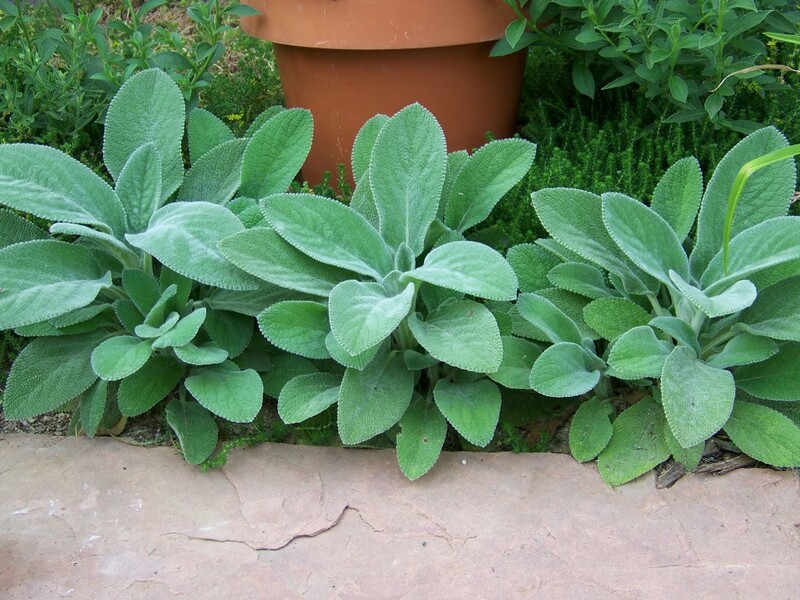 These are durable and versatile plants with massive root systems. 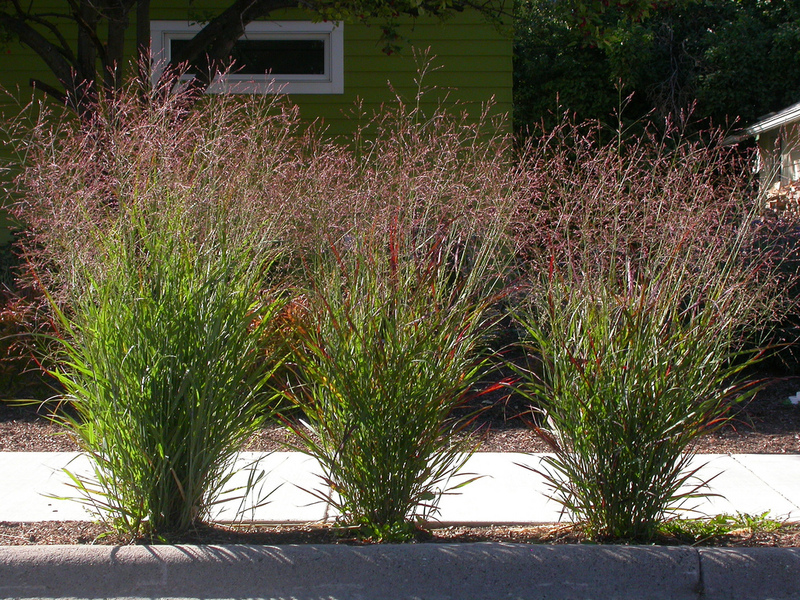 They thrive in moist soils, yet are drought tolerant. Cultivars ‘Shenandoah‘ and ‘Northwind‘ are excellent cultivars for home use due to their upright (non-floppy) and attractive color. Both are easily divided after a few years in the ground. These cultivars are unpatented and suitable for sharing through Open Source PlantsTM .